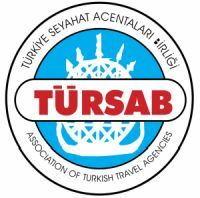 Upon arrival in Istanbul (Ataturk Airport), the city of two continents, you will be greeted by “Turkey Tourkey” representative with Turkish hospitality & accompanied during your transfer to the hotel (Check-In 13:00), where you will be briefed by your travel consultant. Overnight in Istanbul. Your day will commence with a visit to the ancient Byzantine Hippodrome where you will tour the Egyptian Obelisk, Serpentine Column, Fountain of Wilhelm II, the elegant Blue Mosque famous with its heavenly six minarets and the Hagia Sophia Museum, built during the reign of Emperor Theodosius and burned down in the fire of Nika Revolt in 532 A.D. Just before lunch break, you will visit the Underground Cistern. After lunch, you will visit the Topkapi Palace (excluding harem), residence and administrative center of the Ottoman Sultans. Day tour will finish with the visit of Grand Bazaar. Overnight in Istanbul. At the end of the tour overnight in bus. 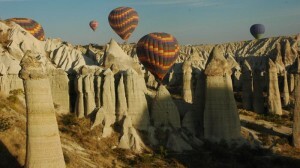 The Explore and Hike Tour visits southern Cappadocia and starts at 09:30 by pick-up at your hotel. After our guide’s introduction to Cappadocia, we drive about 10 min and visit the most spectacular gorge of Turkey: Ihlara. 6 km hike in the Ihlara Valley will be highlight of our day. The Melendiz River has carved an impressive canyon through the verdant valley and we will walk about two hours along the river, passing Byzantine rock chapels decorated with frescoes. Especially the first half of the hike where we will be the only tourists walking, is totally peaceful. 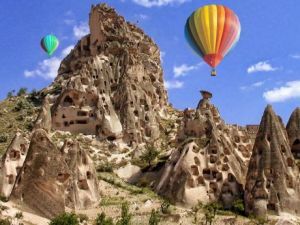 We end the hiking portion of the tour near Belisirma village, where we will have lunch in a quaint riverside restaurant and then we stop at the biggest rock-cut monastery of Cappadocia, Selime Monastery and Kathedral. Selime is the biggest rock-cut cathedral of Cappadocia and located at the end of Ihlara Valley. It has has been used as a fortress by both Byzantine and Seljuk armies during 10th to 12th centuries. We will then drive back to hotels and finish the tour around 16:30. Our professional guide and the driver will pick you up at your hotel at 9:30. The first stop is Esentepe, the impressive panoramic viewpoint overlooking Goreme. Here your guide will give you information on the history of Cappadocia and the unique rock formations. From here we visit the beginning of Rose Valley for an easy one-hour hike through fairy chimneys, orchards and vineyards. Our next stop is the Goreme Open Air Museum, a UNESCO World Heritage site. Your guide will explain the meanings of the frescoes in the cave churches, decorated with scenes of the Old and New Testaments dating back to the 10th century. The site has been used as a monastery since the first years of Christianity. 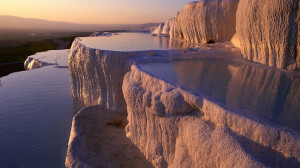 For lunch we will visit a lovely restaurant in Goreme. After lunch we make several photo stops along the way – includingUrgup’s family fairy chimneys, Devrent’s animal-shaped rock formations and Monk’s Valley with the famous mushroom-shaped fairy chimneys as well as St. Simeon’s monk cell carved into the rock. Day one concludes in Avanos, a picturesque town on river that supplies clay for the 4000 year-old Avanos tradition of pottery. A kick-wheel demonstration by a local potter and your chance at trying this ancient custom brings our day to an end back to hotel. 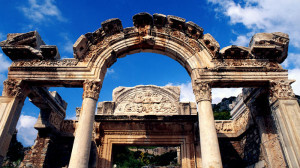 Drive to Ephesus / İzmir and visit to the ancient city of Ephesus. We will spend several hours walking in the footsteps of Alexander the Great, Caesar, Cicero, Apostles Paul and John and many other familiar historical names. The recently opened Terrace Houses (entry included) where the wealthiest Romans lived are an excellent example of sensitive excavation and presentation. The mosaics and frescos are spectacular. Tradition has it that Virgin Mary was brought here by St John after the Crucifixion and lived her final years near the city of Ephesus on an isolated mountaintop. A lovely chapel is constructed on the site tended by Franciscans and open to visitors. It has been designated a pilgrimage site by the Pope. We will continue with Saint John Church where Apostle John spent his final years and he was buried. Visit to temple of Artemis to see the remains of one of the Seven Wonders of the Ancient World. 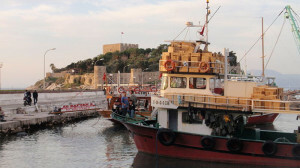 Overnight Kusadasi near Ephesus. 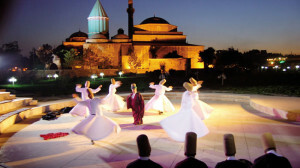 All day drive to İstanbul and overnight in İstanbul. We hope your tour was a memorable one and we would like to see you in the future in one of our tours again.After breakfast check out from the hotel. We make your return airport transfer services. Have a nice trip back home.